A Jillian Vance Design: Wall Decor....Kiss me! So this week I am doing something different. No card but a fun decor project! And yes still incorporating A Jillian Vance Design...in a roundabout way! We have a bathroom that we are updating the wall color and changing the theme. We decided to go with a Navy by Sherwin Williams called Salty Dog...I LOVE this color! Not too deep, not to bright, just right! I really thought I would go with a Nautical theme, however when we were in Nashville we visited a very quaint store called A Thousand Faces. It featured local artists and we found a print we wanted for the bathroom ~ which was name Starry Night in Nashville by Anna B. Webb. And so the theme of Nautical became the theme of STARS!! The colors in her print are perfect for this bath! So this is my project for today. Ed Sheeran is one of the greatest songwriters of today in my eyes. This is my FAVORITE song by him, Thinking Out Loud! It is the ringtone I hear when Sam calls my cell phone, it is just a beautiful song! 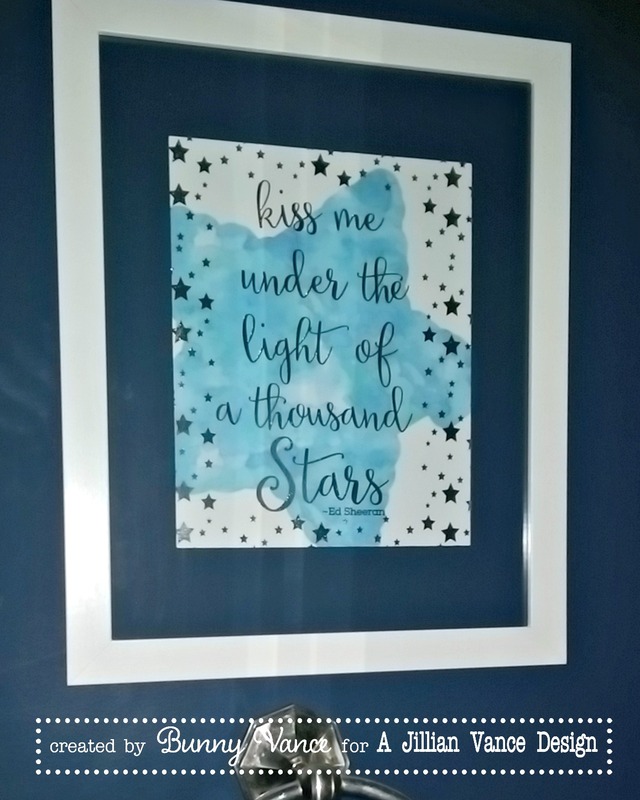 So "kiss me under the night of a thousand stars" was SOOO perfect for this project and the bathroom! So here is how I did it....Using Adobe Illustrator. I chose a blue watercolor swatch from my Illustrator stash and used the star tool and modified the edges...don't ask me how just started adding effects! Then laid out the verse using the font in black text. I felt it needed something else so here is where the A Jillian Vance Design comes in. I took the file for our Stars Background Builder and sized it for this 8 x 10 print! Then subtracted the stars I didn't want over top of the verse! And TADA...my own little print for a frame! BUT that wasn't all. I printed my watercolor star on cardstock with the inkjet printer. Then ran it through the laser printer using the stars and the sentiment. That way I could then add the Silver Deco Foil by ThermOWeb to the stars and verse! I am so pleased with that way it turned out. We got a white frame and then....had a problem, The white mat in the frame was not the white of my cardstock. SO....brough the can of paint from the bathroom up and painted the mat! And here is the finished product! LOVE IT!!! So personalized to our taste and decor theme, AND much cheaper than purchasing the ones you see in Hobby Lobby and Target! Photos were hard to get with the reflection! What a beautiful framed piece! I love it! Love where your inspiration came from!